And now, an unexpected gift. 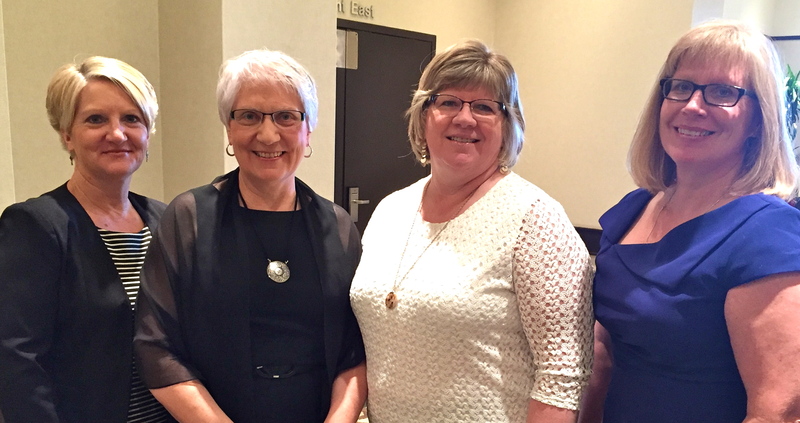 The two sisters who live near one another in Saskatchewan approached my husband and me last spring with the suggestion that we move our 93-year-old mother from her nursing home in Winnipeg to a nursing home in Saskatchewan where one of them works. It was their turn, they said. It would be a privilege, they said. The backstory here is that for the last 25 years or so we have lived close to my parents. We saw them through retirement stays in several apartments, then through my father’s diagnosis and eventual death from Alzheimers, then through my mother’s various hospitalizations and transfer into a nursing home, where she has continued to decline physically and mentally. Circumstances took other family members out of Manitoba so that my husband and I were her only children here. Our own children scattered to other parts of Canada as well. My siblings came to visit and were always supportive, but the fact was, we were the front-line people. 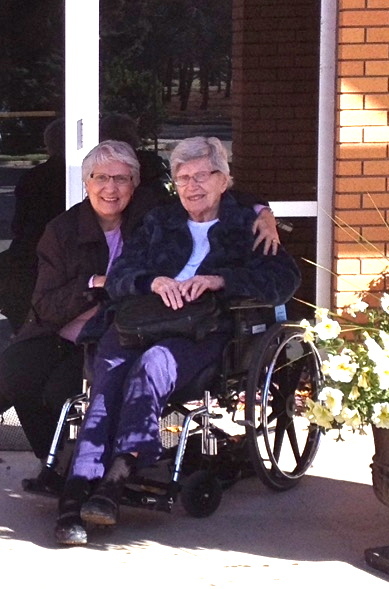 Mom and me at her new home, Mennonite Nursing Home in Rosthern, Sask. My first reaction to this offer was awe at the huge possibility that had suddenly opened up to me. Mom and the eight siblings agreed to the move. Last week, we accomplished it. My emotions have been a thick mix of relief and grief and guilt (I’m still the oldest sister, after all, so should be responsible to the end, right?) and forward-looking-happiness. Plus gratitude for these two amazing women, my sisters. I have a very good idea of what’s been shifted from my shoulders to theirs, and it’s not so much about time or hands-on care as it is the continuous awareness of the other person—the elderly person—in the vicinity, a presence that represents something significant and thus requires something. What it represents and requires is ongoing relationship which yields joy, but is never a light thing either. Sometimes, in truth, it feels heavy. And now they’ve taken it on and I praise and bless them for it. Four sisters. I’m second from left; the two on either side of me are the Saskatchewan sisters now close to Mom; sister on right lives in B.C. This entry was posted in Personal, Women's lives and tagged elder care, sisters by doradueck. Bookmark the permalink. Oh Dora, so well put; such warm sentiments filled with the emotion that comes with family caring for loved ones. I’m not surprised this resonates, Eunice, as you had such a key role in your mom’s life and also experienced many emotions around that. You often inspired me in that regard. PS – Love the photos, especially the one of you and your mom! Wonderful blip, Dora. Unlike you, I have four wonderful sisters, and you are the leader in this small crowd. I have five sisters, and, like you, I am the oldest, and I resonate with what you write about being the bossy one. Unlike you, however, I was the one who was always far away. Just before we moved, when I was looking forward to spending more time with her, Mom passed away. We all miss her so much, she was our “go to” person. Frail physically at the end, she remained bright in her mind. She is still the glue that keeps us together. She was an only daughter and she always told us how lucky we were to have sisters! I’m sorry that you missed that opportunity, Elfrieda. I suspect you exchanged letters, though, which is a different but also special experience. Interesting that, though gone, she remains the glue that holds you together. Yeah, pretty great sisters … and you should see them dance! I have one sister 10 years younger than me. I too have seen our relationship change from big sister, little sister to wonderful supportive friends who have both lost their partners. In a few days we will go on a river cruise together and I know we are going to have an amazing time together. I don’t know what I would do without her. I forget the names of your sisters. I think one is Viola, right? Do enjoy your river cruise, how wonderful to have this companionship at this time. — And yes, Viola’s on the right. The others are Louise (far left) and Linda. Actually Dora, I think it’s us over here who have received a gift from you. It’s funny because that is exactly what I was thinking as I was visiting Mom yesterday. It’s been 38 years since I have lived in the same province as mom and I consider it a privilege to now be able to be a bigger part of her life. Thank you for all you have done for her and dad and for being willing to ‘let her go’. Thank you! Yes, it’s about letting go, that’s a good reminder.